Phentermine is a medication classified as an “anoretic” medication, meaning it helps you lose weight, and has been an FDA approved medication since 1959. Simply stated, phentermine stimulates the brain to increase activity of the sympathetic nervous system. In doing so, our appetite is suppressed and our cravings are decreased, while our metabolism is increased. The medication lasts about 10-12 hours in most patients and is usually taken in the morning. It is classified by the DEA as a controlled substance and can only be obtained with a prescription from a doctor. No. Fen-Phen was a combination drug containing both fenfluramine (no longer on the market) and phentermine (still on the market). This combination worked well to help with weight loss but had potential cardiovascular side effects, including heart valve damage. Although Fen-Phen was removed by the FDA, the individual drug, phentermine, remained after many safety studies were completed. 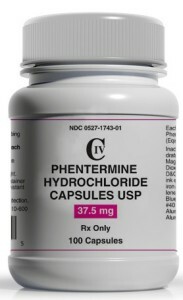 Phentermine’s safety has not been questioned nor did it play a role in any of the adverse effects of Fen-Phen. The most common side effect is dry mouth, however, this can be a good thing because it encourages you to drink more water. Some patient’s experience insomnia or trouble sleeping, especially if they take the medication later in the day. Some patients may feel jittery or anxious, however, many patients interpret this as feeling more energetic. This is a direct result of the activation of the sympathetic nervous system which is the same system that causes the “fight or flight” reflex. If you have an arrhythmia (which will be detected by Dr. Pinto during your initial visit with an ECG), this medication can cause it to worsen, so not everyone can take phentermine. However, our office is very diligent in patient safety and no patient will be given a prescription if there is potential for complications because of pre-existing medical problems. Most pharmacies charge about $25-30 for a month supply of phentermine if you are paying cash. Some insurances do cover phentermine and because it is generic, may have no or minimal copay. We do not dispense pills from the office, rather, you are given a prescription to take to the pharmacy of your choice. How long can I take it? While the FDA originally approved phentermine for short term weight loss of 12 weeks or less, it has been safely used much longer by experienced physicians for much longer. Our goal is to help you lose weight and then maintain your weight loss. If taking phentermine longer than 12 weeks is necessary and you have no medical reasons why you can’t take it, then you can stay on the medication longer. In the newer medication, Qsymia which contains phentermine, length of treatment can be as long as two years. Dr. Pinto has had patients on long term phentermine and they are doing fantastic. How do I find out if I can take phentermine? The best way to see if you are a candidate for medication to lose weight is to see Dr. Pinto or one of the other medical providers at Vive Medical Weight Loss & Aesthetics for a consultation. This 45 minute visit will include a full medical history, physical exam, ECG, and body composition analysis. If you qualify and the medication seems to be a viable choice, then you will be given a short term trial prescription. If you are able to take the medication without any issues, then we will prescribe the medication on a month to month basis for as long as we deem necessary for your weight loss and weight loss maintenance.